Tips for choosing a diamond shape for engagement rings! Choosing an engagement ring is a truly, forever investment. Set in halos or hearts, the diamond in it should also be suitable, comfortable and fitting to make a happy forever for the wearer! Do you know how to differentiate your diamonds like marquise from radiant? What does the shape of a Diamond mean? Buying a diamond is not all about pronging the glitter of your dreams, instead diamonds should be chosen with knowledge rather than on the basis of the trendiest diamond geezer advertisements! You must have noticed that the eye-catchy factor of every diamond buyer guide for engagement rings is its versatility of choosing a diamond based on, the cuts. An equally important aspect to look at when choosing the shape of your diamond is with respect to how it fits with your slender fingers and your unique personality or style. The shape is the geometry of the structure or silhouette of your diamond. Often used interchangeably, shape and cut of a diamond are distinct. Shape refers to the geometrical form of a diamond, while cut denotes the polishing efficiency of the diamond. For example shape of a diamond can range from round, pear, and marquise to oval while the cut of a diamond can be the step, signature, round and square cuts, which analyzes the diamond’s depth and angles of reflection. What are the Ten Basic Shapes of Diamonds? The costliest and the most popular diamond shape since ages, a roundly shaped diamond is also considered the best amongst most diamond experts. These cost more than the fancy shaped diamonds because a high carat weight of the diamond is chipped off while perfecting round cut brilliance! An ideal round cut diamond maximizes the brilliance of light and fire, according to Tolkowsky- Diamond Design: A Study of the Reflection and Refraction of Light in Diamond. What it says about you? Infamous since the dawn of 20th century, Round Shaped diamonds are considered classic on a wearer and constitute 75% of the world’s diamond demands. The hassle-free preference of the wearer is lucid and the brilliance, truly fires the discipline in personality! Who does it fit the best? These are ideal on slender long fingers, but if you have a habit of keeping short nails, this will not complement your finger. The same goes with short fingers. Made from stones with cutting-edge clarity and high color density, Emerald Shape is made from edged bevels with a rectangular large facet. The length to width ratio of the diamond is 1.00: 1.90. The emerald cut diamonds are renowned for their half of mirrors effect and lack in high brilliance. The elegance of the diamond is visible when the light and dark planes interplay with light while observing dramatic flashes from these diamonds are common too. Originally manufactured for cutting of emerald diamonds, emerald shapes are popular with contemporary celebrities. Known as the trademark of glamorous art lover with a tint of vintage tastes, Emerald Diamonds are a personality statement too. 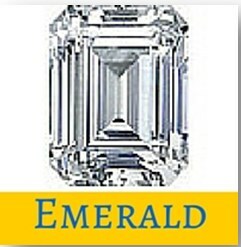 With its long and slender, yet large facet, Emerald shape of diamonds refers to the cool streak in the wearer. It fits best for people with long or for broad fingers but unfit for heavy hands. Amal Clooney- from George Clooney, Beyonce- from Jay Z, Sarah Jessica Parker- from Matthew Broderick, Elizabeth Taylor- from Michael Todd and Grace Kelly- from Prince Rainier of Monaco. Cut from an octahedron stone, princess cuts are also have the best cost-efficient shapes in diamonds. Polishing and burnishing a princess shaped diamond retains 60% of the rough stone. The maximum yield and efficiency of 900 corners, makes it a cost-efficient buy as it is priced lower and has cleaner angles. The diamond has four shapes of equal length, also with rectangular shapes as length: width of 1.05 to 1.08. There are chances of additional inclusions and facets owing to the fact that Princess shape diamonds are cut from the rough edges of the corner stone. 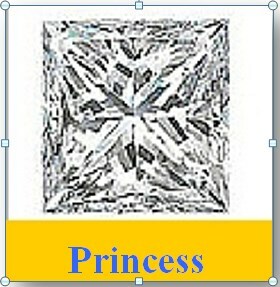 Wearer of a princess shaped diamond suggests a ladylike or strongly feminine personality and taste. As the extra facets increase the brilliance and fire of the diamond, it is regarded as the best sparkling diamond for the fun-loving chic! It is also regarded best for a person who loves the optimum mix of tradition with modern values. The princess diamond shape fits best for most fingers, exclusively better for a person with broad fingers. Cushion diamond has large facets structured as a square cut with rounded corners. One of the most popular diamond shapes that were de facto until 20th Century, Cushion cut diamonds are in the diamond jewelry trend since a few hundred years now. Lesser in brilliance that round shaped diamonds, cushion shapes are referred to as pillow shapes and have better fire than all other diamond shapes. With three standard facets for pavilion, the cushion shaped diamond even has modified varieties with extra facets. 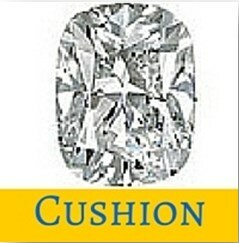 The length to width ratio of the cushion shaped diamond is 1.00: 1.05. Known for its vintage and antique look akin to emerald shaped diamonds, cushion diamond wearers are known for their romantic attitude. For people who care about clarity of a diamond, as well as the Carpe Diem personalities cushion shape of a diamond is ideal! This diamond is best for people with long, short, slim and broad as well as heavy fingers. An eye-catching symmetry like never seen before, Oval shaped diamonds are made from modified brilliant cuts. 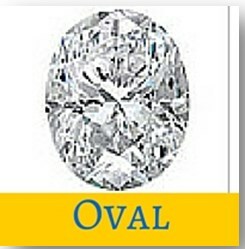 The best attractive feature of choosing your diamonds in oval shape is that it gives a heftier look to the diamond. This illusion of bigger size owes it to the large faucet and length to width ratio of 1.35:1.50. If your dream design has side stones, it is optimum to choose an elongated oval diamond shape according to diamond experts when choosing an oval shape for your diamond ring. Not caged within the conventions, you have a unique and exemplary taste in choosing your diamonds. This timeless gem emits an equal fire and brilliance as a round shaped diamond gives the wearer an innovative air. This diamond is best for people with small hands and broad or short fingers. 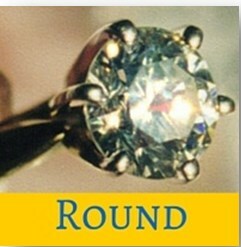 As the ring can be set in horizontal or vertical positions, you can further cross-check varied setting on your finger. From narrow to fat, there are varieties of heart shaped diamonds in the trend ranging in the length-width ratio of 0.95 to 1.15. Depending on the skills of your gem cutter, the ratio will change. 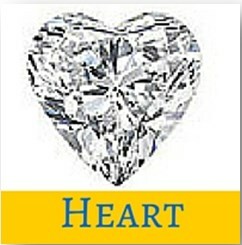 Improperly cut heart shapes will look flatter with a shadow effect, than the ideal heart shaped diamond. The ideally symmetric heart shaped stone can be selected in various colors to add to its innate brilliance and fire. A step above the romantics, a heart shaped ring is a personality statement of being sentimental, caring and loving. The heart shaped diamond is more of a novelty item with intimate values ideal for the lover duo engagements. This diamond is best for people with small hands and short and broad fingers. The diamond complements the hand by giving it an elongated look. The combination of two brilliant shapes- the round and the marquise, pear shaped diamond is worn with the pointy head directed towards the hand of the wearer. This shape has a length to width ratio of 1.40: 1.70, with the round end lining up the points and upper-lower curves uniformly forming the sides with no roughness or flatness around its edges. From fat to slim, there are subjective variations that you can set or decide on the basis of the gem cutter skills at a jeweler. 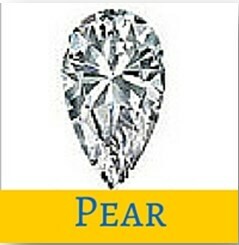 Pear shaped diamonds often portray a mild to lucid bow tie or teardrop look to the diamond, fit for wedding rings. Amalgamated from the very best of marquise and round shaped diamonds, pear diamond wearer has a unique personality. The pear shaped ring is of high sentimental and romantic value, with a dash of celebratory teardrops! Often referred as the drop cut diamond, a pear shaped diamond slenderizes your fingers, making it fit for people with heavy and shorter fingers as well as all other types of fingers. 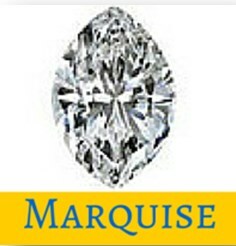 Infamous as the football shaped diamond, marquise shape derives its etymology from Marquise of Pompadour who was proposed by King Louis XIV of France, designed in the shape of her perfect smile (mouth). Marquise diamonds can range from varying degrees of fat to slim ratios of length to width such as 1.75: 2.15. With both sides on the marquise stone forming mirror-like images the points should be mutually aligned. Prongs should be set on the pointy heads to protect the stone and to preserve its perfect symmetry. The higher cost of stone owes it to the perfection of symmetry, achieved only by a skilled diamond cutter. As the diamond is cut off the edges of its rough stone, minor inclusions and extra facets can impact the price of the diamond as well. This is one of the renowned diamonds, favored for its ‘larger than the inside’ effect. The marquise wearers are ‘out of the box’ thinkers, often known for their dramatic tastes in jewelry. Made in the replica of Marquise of Pompadour’s beautiful smile, the diamond is for the daring women who like a dab of opulence in their jewelry arsenal. This diamond is best for people with short and broad fingers when the diamond is set in a horizontal position. First of the square shaped diamonds, the radiant shaped diamonds have a brilliant-cut pattern of the facet, equally on both crown and the pavilion creating the highlights of princess and cushion shaped diamonds. Variation of radiant shaped diamonds includes rectangular silhouettes where the diamond also projects like an emerald look with its bow-tie effect upon physical observation. 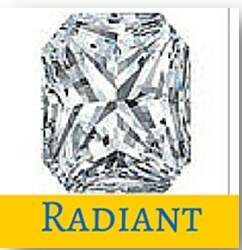 The length to width ratio of the radiant shaped diamonds ranges from 1.00 to 1.35. Set with the fiery brilliance of the roundly shaped diamonds, radiant shaped diamonds are rare to find and hence, one of the elite most engagement rings that refer to a luxury loving wearer. This diamond is best for people with any kind of fingers, long, short, wide or slim fingers. 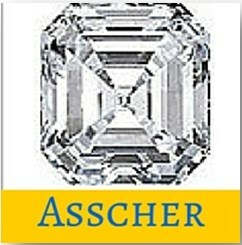 The asscher shaped diamond revived in 2002 and is a sought after shape at present. Portraying the pattern similar to the square emerald cut with broad and thin facets in step cut. The first patented diamond shape, Asscher shape of diamonds derive an octagonal shape due to its trimmed corners. The timeless classic of asscher shaped diamond is of the length to width ratio 1:1, while the modern ones range up to 1.08. Owing to the open faucets that are cut in large steps, the colors are effectively highlighted on an asscher engagement ring. With a high refraction of light happening on the gem in your ring, the asscher diamond wearer is a vintage lover with a striking uniqueness. The chunky look of the diamond in its trimmed corners enhances the cool streak in the wearer’s personality. This diamond is best for people with all types of fingers; the deciding factor on the asscher diamonds is the proportion of length to width of the stone. Apart from the classic ten diamond shapes there are many more shapes in categories such as customized fancy cut diamond and old cuts such as Old Miner and Old European cut.